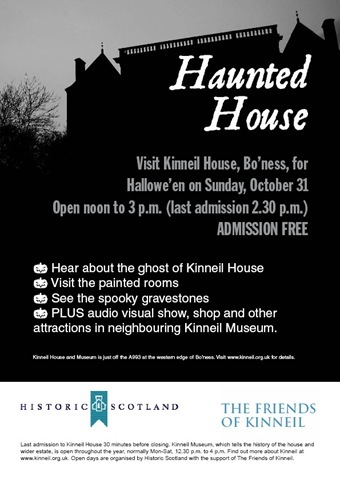 KINNEIL House in Bo’ness – which boasts its own “White Lady” – will provide free access to visitors this Hallowe’en, Sunday, October 31, 2010, from noon until 3 p.m. The imposing mansion is said to be haunted by the ghost of Lady Alice Lilbourne, who fell to her death from one of the building’s top-floor windows. Adrian Mahoney, of the heritage group The Friends of Kinneil, said: “Lady Lilbourne was the wife of a Cromwellian General who was stationed at Kinneil House in the mid 17th century. The story goes that the marriage was not a happy one, and Lady Alice was locked into an attic room overlooking the rocky ravine and burn below. Kinneil House dates back to the 15th century and was once a popular home for the Dukes of Hamilton. The building was re-modelled in the 1540s and transformed into a stately home in the 1660s. Demolition was halted in 1936, when renaissance wall paintings – said to be amongst the finest in Scotland – were discovered and the property was put into the care of the Ministry of Works, now Historic Scotland. For the past two decades, access to the house has been limited. However, Historic Scotland is now working with The Friends of Kinneil group to increase the number of public openings. The neighbouring Kinneil Museum – run by Falkirk Council – will also be open on Hallowe’en. The museum provides an audio visual show on the history of Kinneil House and the surrounding Kinneil Estate, which also features a medieval church, a Roman fortlet and a cottage used by inventor James Watt. For many, however, the potential to see a ghost will be one of the main attractions. The writer Maria Edgeworth visited Kinneil and the last occupants of the house – the philosopher Dugald Stewart and his wife – in June 1823. She wrote: “Mrs. Stewart told us this morning that there were plenty of ghosts at our service belonging to Kinneil House. One in particular, Lady Lilburn (sic), who is often seen all in white, as a ghost should be, and with white wings, fluttering on the top of the castle, from whence she leaps into the sea–a prodigious leap of three or four hundred yards, nothing for a well-bred ghost. Visiting Kinneil House for the first time? Click www.kinneil.org.uk/map for directions. This entry was posted in Uncategorized on September 29, 2010 by Friends of Kinneil.